West London Poor Law Union formally came into existence on 13th December 1837. Its operation was overseen by an elected Board of Guardians, 20 in number, representing representing its 7 constituent parishes as follows (figures in brackets indicate numbers of Guardians if more than one): Bridewell precinct; St Andrew, Lower or City Liberty (4); St Bartholomew the Great (2); St Bartholomew the Less; St Bride's, otherwise St Bridget, Fleet Street (5); St Dunstan's West (2); St Sepulchre, Newgate (5). The population falling within the new Union at the 1831 census had been 27,825 with parishes ranging in size from Bridewell precinct (population 456) to St Sepulchre, Newgate(7,710). The average annual poor-rate expenditure for the period 1834-36 had been £17,522 or 12s.7d. per head of the population. Initially, the union took over two former parish workhouses. That of St Sepulchre Newgate, on West Street, near Smithfield Market, was used for males, while that of St Bride, on Shoe Lane, housed females. Following enlargement of the West Street premises in 1840, the females were transferred there and Shoe Lane was closed. The location of the West Street workhouse is shown on the 1862 map below. West London Union workhouse site, c.1862. Cadger, sleeping in diferent refuges. The poor creatures, in answer to inquiries made of them, stated that upon entering the building a small portion of bread had been given them, but that it was the custom to turn them out in the morning without anything to eat unless they first broke a quantity of stones, of which there was a large heap in the yard. The Lord Mayor and his friends next entered an adjoining cattle-shed, where they found two destitute women huddled together on a rug, lying on the bare ground, almost perished with cold, and without either fire or food. 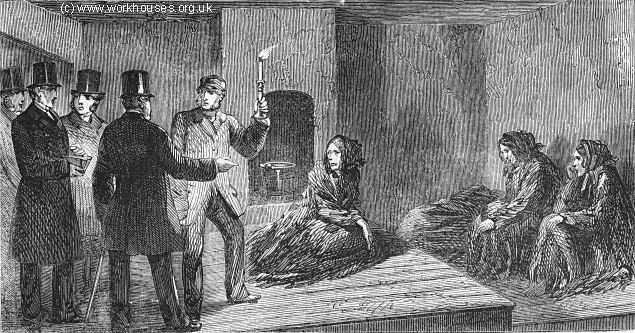 When they had concluded their inspection the party of visitors went off to the City Gaol, at Holloway, where they found 455 prisoners, well lodged in separate apartments, with plenty of bedding, blankets, and comforts of every kind. Well might the Lord Mayor say, "If the poor were treated in such a way as that, was it not natural that they should resort to crime rather than submit to it?" West London workhouse men's casual ward, 1857. West London workhouse women's casual ward, 1857. The West London Union operated a separate Union School, sometimes referred to as its 'children's workhouse', at Edmonton. It was located at the south side of Meeting House Lane (later Bridport Road and Church Road) which ran from the west side of Upper Fore Street. In 1849, the establishment was said to house up to 150 children. In 1864-65, the union erected a new workhouse for 500 inmates at the west side of Shadwell Road (now Cornwallis Road) in Upper Holloway. The official opening of the establishment was carried out by the Chairman of the Guardians, Mr S.P. Colman, on 26 June 1865. The architects of the scheme were Searle, Son and Yelf, and the builder was Henry Hart. The cost of the building contract was £23,492. The T-shaped building was in the then popular Italianate style. Administrative offices and the Master's quarters were placed at the centre, above which rose a lofty tower in which was concealed a large water storage tank. Male accommodation was located in the southern wing, and female in the north. A dining-hall with a chapel above it lay to the rear. The site location and layout are shown on the 1873 map below. West London Union workhouse site, 1873. A view published in 1864 shows the front facade of the proposed design. West London workhouse proposed design from the north-east, 1864. The West London Union was wound up in 1869 with its constituent parishes being transferred to the City of London Union. By 1882, the Cornwallis Road workhouse had been taken over by the St Mary's, Islington Board of Guardians. The building was used as an internment camp during the First World War and appears never to have re-opened. The premises were sunsequently used as a storage depot for telephone equipment. The site is now occupied by the modern housing of Cornwallis Square. Up until 1850, the union also operated a separate school housing 150 children on Meeting House Lane (now Church Road), Edmonton. London Metropolitan Archives, 40 Northampton Road, London EC1R OHB. Holdings include: Guardians' minute books (1839-1869); etc.